We aspire to be the leading provider of hospice services for people in Michigan and Illinois with a life-limiting illness. We are committed to equipping our highly trained and dedicated employees with all of the resources necessary to provide extraordinary care and service. Residential Hospice provides a team of specially-trained professionals and volunteers to provide care, comfort, support and dignity to patients and families when their illness no longer responds to cure-oriented treatments. Residential Hospice brings better care home to patients and families by offering them individualized care plans, developed with their physicians and carried out in familiar surroundings with compassion, dignity and support. 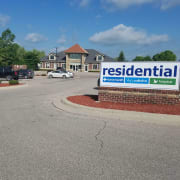 As part of the Residential Home Health family of companies, Residential Hospice is ready to provide expert medical care, emotional comfort, spiritual support and pain management to meet the needs of each patient. Residential Hospice’s objective is caring, not curing, helping patients and their families focus their energy on the things that matter most. Would you recommend Residential Hospice?